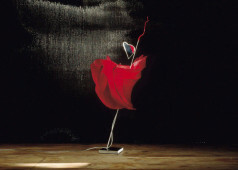 The Ingo Maurer Alice F. Cooper is the floor lamp out of the Cooper series. 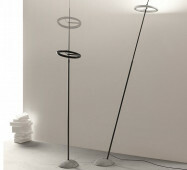 The Ingo Maurer Alice F. Cooper is the floor lamp out of the Cooper series. 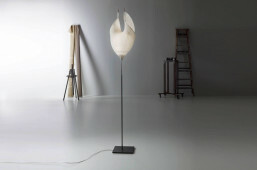 This lamp mostly consists of a hosepipe being inflexible at the lower part and flexible at the upper area. The reflector is rotatable at 360° around the illuminant. Thus you may use the Alizz F. Cooper both as interior light and as reading light. The height is variable between 130 and 190 cm due to the flexible hosepipe. A cord dimmer with slide control is attached to the power cord making it possible to continuously dim the Alliz F. Cooper. The full effect is unfolded when the Ingo Maurer Alizz F. Cooper is snake-like looped.